This is one of an extensive series of still photos documenting the arrival and ultimate capture and berthing of the SpaceX Dragon at the International Space Station, as photographed by the Expedition 39 crew members onboard the orbital outpost. The spacecraft was captured by the space station and successfully berthed, following the April 20 arrival. The world is about to get its first look at SpaceX's new astronaut taxi. Next Thursday (May 29), the company will unveil the crewed version of its Dragon spacecraft, which SpaceX hopes will be ferrying astronauts to and from the International Space Station a few short years from now. "Sounds like this might be a good time to unveil the new Dragon Mk 2 spaceship that ‪@SpaceX has been working on [with] ‪@NASA. No trampoline needed," SpaceX's billionaire founder and CEO Elon Musk wrote in a Twitter post late last month. "Cover drops on May 29. Actual flight design hardware of crew Dragon, not a mockup." 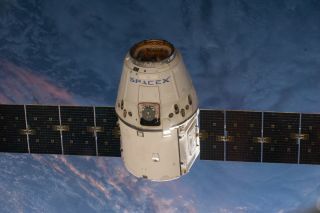 The manned vehicle is an upgraded variant of SpaceX's robotic Dragon cargo capsule, which has already flown three resupply missions to the space station for NASA. The company holds a $1.6 billion deal to make 12 such flights for the agency. SpaceX has been developing the manned Dragon with financial help from NASA's Commercial Crew Program, which aims to get at least one private American astronaut taxi up and running by 2017. The program seeks to end the nation's reliance on Russian Soyuz spacecraft, which have been astronauts' only means of transport to and from the orbiting lab since NASA's space shuttle retired in 2011. NASA's commercial crew program has also supported the efforts of other companies. For example, Boeing and Sierra Nevada Corp. also received funding recently to advance work on their vehicles — the CST-100 capsule and a space plane called Dream Chaser, respectively. While Musk hopes SpaceX wins a contract to carry astronauts to and from the space station for NASA, he has bigger dreams for the company. Musk has said he established SpaceX primarily to help humanity become a multiplanet species — specifically, to play a major role in establishing a permanent Mars colony. The company is therefore working hard to develop fully and rapidly reusable rockets, which Musk says could reduce the cost of spaceflight by a factor of 100. During last month's Dragon launch toward the space station, for example, SpaceX succeeded in bringing the first stage of its Falcon 9 rocket back to Earth for a soft ocean splashdown.